Before we answer this question, we want to explain a bit about what a call-to-action (CTA) button is. As explained in one of our earlier blog posts, a website’s homepage is the front gate of a business. There are many different components such as content, design and layout that must be carefully placed to make a great website. Above all of these elements on a website, the most important element is to entice a prospect customer to take action, which could be purchasing a product, requesting a demo, or scheduling an appointment. This is where a call-to-action button comes into play. And it might take multiple attempts before getting it right. CozyCal’s scheduling button is essentially a call-to-action button. 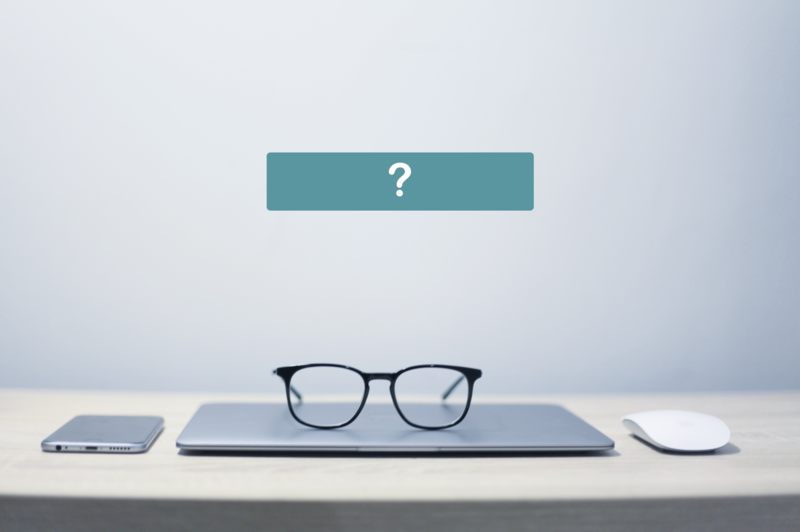 Either you choose to embed the button in a fixed or floating form on your website, the key is to make sure that it is attention-grabbing and placed where it could be easily seen. Now, let’s take a look at two case studies to see how two CozyCal users have leveraged the scheduling button to book more appointments through their website. Sires Eyewear is one of CozyCal’s earliest adopters, and they have been receiving a healthy stream of bookings through their website. A clear and compelling copy: Notice that above each of the “SCHEDULE AN APPOINTMENT” button, there is a block of enticing message that highlights the product’s unique feature and service. In this case, the message acts an emotional trigger that convinces the users to click on the scheduling button to book an appointment. To make a CTA button work, you should surround it with a clear value message that naturally guides the reader’s ‘journey’ to end on the scheduling button. Non-intrusive visual contrast: In this case, the scheduling buttons can either draw a stark or more subtle contrast with the backgrounds. On Sires website, the black “NEED HELP?” button has a stark contrast that makes it stand out. But the stark contrast is customized to match with the site’s nav bar at the top, which is also black. 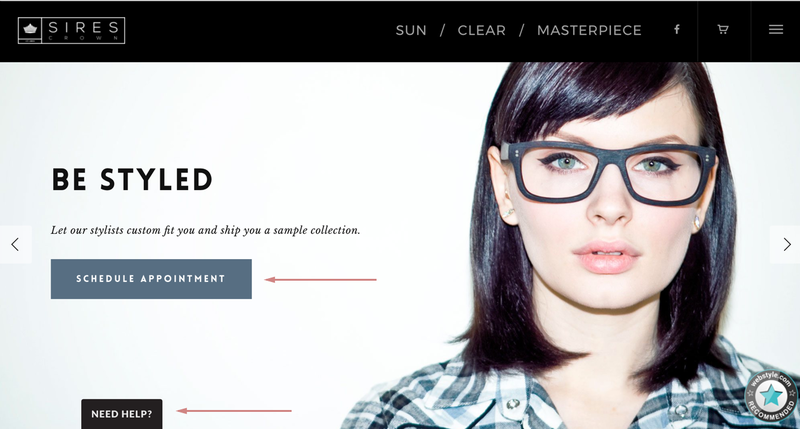 Embed more than 1 CTA button at multiple locations: Sires Eyewear uses a mixture of both fixed and floating scheduling buttons at different locations on their website to ‘nudge’ users to take action. However, you don’t want to plaster CTA buttons all over your site since they could annoy the users, causing them to leave your site. Therefore, depending on the type of product or service you are providing, the number and positioning of scheduling buttons should be carefully ‘mapped out’ on your site. 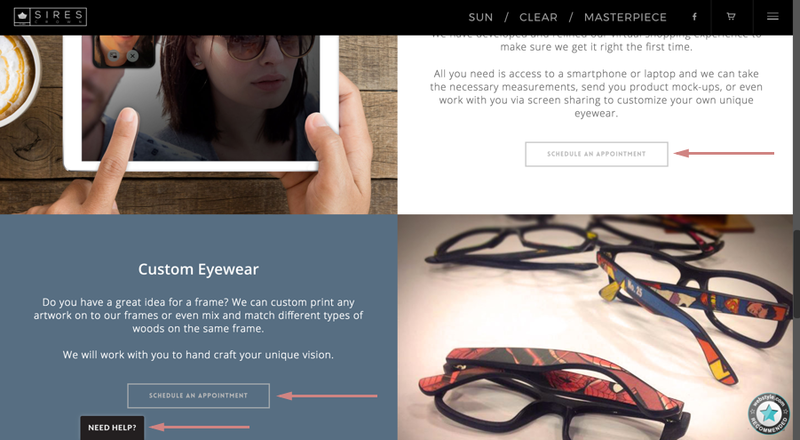 Third Marble Marketing (TMM) runs a business that is totally different from Sires Eyewear. Instead of selling an elegant product, TMM is selling a valuable service. Chris (the Google Guy) from TMM told us that embedding the “Schedule a Phone Call” button helps increase the number of leads they get from the website. Combination of buttons: Similar to Sires Eyewear’s website, TMM is also using a combination of floating and fixed buttons on the website to trigger an action from prospect clients. As you scroll to near the bottom of the page, you will notice that “Schedule a Phone Call” button is placed side by side to the “Call Us Today” button. This positioning makes sure that whichever action the prospect clients choose to take aligns with their own schedules. Sharp contrast: TMM uses red for the scheduling buttons which really make them stand out on the website. Yet, notice how TMM’s logo and the top CTA line are also red? The red color creates a sense of urgency that propels the visitor to take immediate action. There’s one caveat about choosing the color of the button. It’s best to not introduce a strong color that is not appearing anywhere else on the website for your scheduling button. Size: The fixed “Schedule a Phone Call” button is bigger than the floating one. The button shouldn’t be too small or it will be hard to notice and click. The benefit of having a big button is for better display on mobile devices.When prospects are scrolling on their mobile phones, a button sized big enough for their fingerpad will be more likely to trigger an action for them since it’s much easier to tap on. Customizing and positioning scheduling buttons in a way that maximize their attention-grabbing potential will take some trial and error. Remember that when a prospect client lands on your site, the buyer’s journey starts instantly. To increase the likelihood of them clicking on that golden “SCHEDULE NOW” button, you must place your button at a specific point that fulfills their needs. Experiment with different styling and placement of the scheduling button, and see which one succeeds in resonating with the customer. If you have any tips in how to unleash the lead-generation power of your scheduling button, please share them with us!